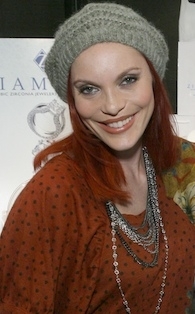 Carmit Bachar poses for us at Ziamond Cubic Zirconia CZ Jewelers. Ziamond Cubic Zirconia CZ Jewelers feature 14k gold, 18k gold and platinum set with the finest hand cut and hand polished cubic zirconia cz. All Ziamond cubic zirconia cz are cut to exact diamond specifications and come with a lifetime warranty.